Today’s women manage complex farms and agribusinesses, innovate food production and land conservation, lead local and national organizations, and teach the next generation. As women take on challenging new roles, they are generating significant influence on rural communities and national food security. To meet the needs of this dynamic audience, we strive to collaborate across boundaries of expertise and discipline while bringing together county, campus and field specialists. 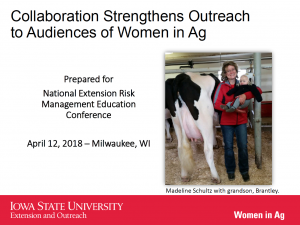 The mission of the Iowa State University Extension and Outreach Women in Ag Program is to provide research-based educational programs that expand agricultural enterprise, improve natural resource management, and support the community of women in agriculture. Our methods include borrowing from the Balanced Scorecard framework to manage our work around four strategic goals: 1) deliver quality education by streamlining internal program development processes, 2) connect and communicate through increased external stakeholder involvement, 3) build organizational capacity through teamwork and professional development, and 4) create public value by managing financial resources for greatest stewardship and impact. We provide education to extend knowledge and empower women through local and online courses, local and online networks, conferences, tours and special events. The participant impacts and public value generated by our work are demonstrated through our program evaluation and reporting. We will give session participants models and tools they can adapt or replicate for extension programs in their own states. Participants will gain ideas they can apply to a range of programs or audiences including how to create curricula; build statewide coalitions; generate research and scholarship; and develop partners in government, industry and extension. With training and mentoring, women are willing and able to take important actions to grow agricultural businesses, conserve soil and water, and improve lives.